Heavy rain pummeled the region Thursday and brought flooding across the area. Flood warnings remain in effect for parts of Northern Virginia and Maryland through Friday morning. The heaviest rain has moved out, but light rain and drizzle will continue into the morning hours. Storm Team4 has declared a weather alert. 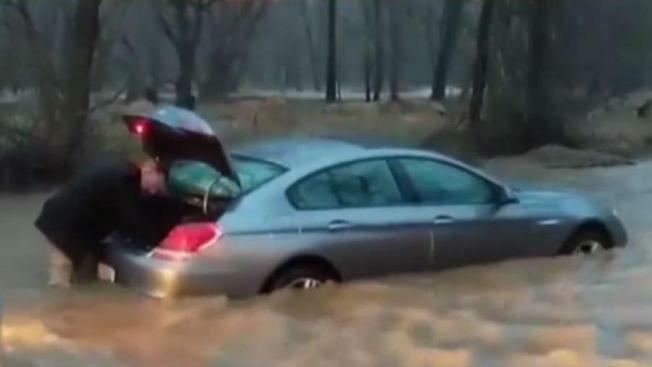 Some flooded roads were closed off in Fairfax County, Virginia. Fire and rescue teams saved a driver who got stuck in high water at Woodburn Road and Spicewood Drive in Annandale, News4's Shomari Stone reports. Flood waters also shut down Beach Drive and Cedar Lane in South Kensington, Maryland. In D.C., a giant rock fell from a cliff along Canal Road after Arizona Avenue. WTOP's Dave Dildine reports the rock struck a car and the car was towed. It's not clear if anyone was injured. A total of 1-3 inches is likely to fall by the time the system moves out between midnight and 4 a.m. Friday, Storm Team4 said. A flood warning is in effect for parts of Fairfax, Fairfax County, Fauquier County, Frederick County, Loudoun County, Manassas Park, Manassas, Montgomery County, Prince William County, Warren County and Washington County. Temperatures stay chilly, dropping into the 30s in most of the region. Strong winds will be the next big issue, Storm Team4 says. Expect wind gusts of up to 45 mph on Friday. With winds this strong, Storm Team4 says there could be downed trees and isolated power outages. A few spotty showers are also possible on Friday. Saturday will be blustery and cold with Sunday shaping up to be the better of the two weekend days.